A contemporary lifestyle products purely lead-free and microwave friendly, a new way to present your kitchen and interiors. 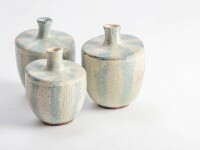 Khushboo  is a ceramist with an experience of almost a decade. A graduate in Fine Arts from JJ school of Arts – Mumbai, she learnt pottery in Auroville and apprenticed under P.R Daroz in Delhi. . She has attended four month art residency in France and recently concluded seven month course in Golden Bridge Pottery, Pondicherry. She started Kriya studio pottery in Bandra in 2010 and conducts regular Pottery classes & workshops, participates in exhibitions and undertakes commission work. Please reach out to m right away in case my creation appears to be damaged on delivery !